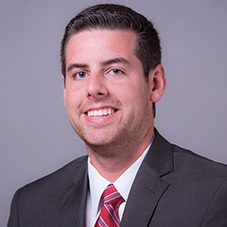 Riley Hall is in his third year with the Razorbacks and first as video coordinator in 2018-19. In his current role, Hall oversees collecting game tapes, breaking down practice and game footage for instructional use and organizing scouting video for the Razorback coaching staff. Previously, Hall spent two seasons as a graduate assistant with the Razorback men’s basketball program in 2017-18. His duties then included overseeing all student managers, supervising practice preparations, directing and sending mailouts for current and future recruits and reviewing film breakdown/scouting reports for potential opponents. Prior to coming on staff, Hall served as a student manager from 2013-16. The Bryant, Arkansas, native graduated from the University of Arkansas in May 2016 with a bachelor’s degree in kinesiology. He completed his Master’s in Recreation and Sports Management in 2018. Hall married the former London Farrar on August 4, 2018.